Sophisticated analysis of data can sometimes tell police where criminals are headed. It’s academic now, but the LAPD plans to get involved. The future of crime fighting begins with a story about strawberry Pop-Tarts, bad weather and Wal-Mart. With a hurricane bearing down on the Florida coast several years ago, the retail giant sent supply trucks into the storm to stock shelves with the frosted pink pastries. The decision to do so had not been made on a whim or a hunch, but by a powerful computer that crunched reams of sales data and found an unusual but undeniable fact: When Mother Nature gets angry, people want to eat a lot more strawberry Pop-Tarts. Officials in the Los Angeles Police Department are using the anecdote to explain a similar, but far more complicated, idea that they and researchers say could revolutionize law enforcement: predictive policing. Predictive policing is rooted in the notion that it is possible, through sophisticated computer analysis of information about previous crimes, to predict where and when crimes will occur. At universities and technology companies in the U.S. and abroad, scientists are working to develop computer programs that, in the most optimistic scenarios, could enable police to anticipate, and possibly prevent, many types of crime. Some of the most ambitious work is being done at UCLA, where researchers are studying the ways criminals behave in urban settings. One, who recently left UCLA to teach at Santa Clara University near San Jose is working to prove he can forecast the time and place of crimes using the same mathematical formulas that seismologists use to predict the distribution of aftershocks from an earthquake. Another builds computer simulations of criminals roving through city neighborhoods in order to better understand why they tend to cluster in certain areas and how they disperse when police go looking for them. The LAPD has positioned itself aggressively at the center of the predictive policing universe, forging ties with the UCLA team and drawing up plans for a large-scale experiment to test whether predictive policing tools actually work. The department is considered a front-runner to beat out other big-city agencies in the fall for a $3-million U.S. Justice Department grant to conduct the multiyear tests. LAPD officials have begun to imagine what a department built around predictive tools would look like. 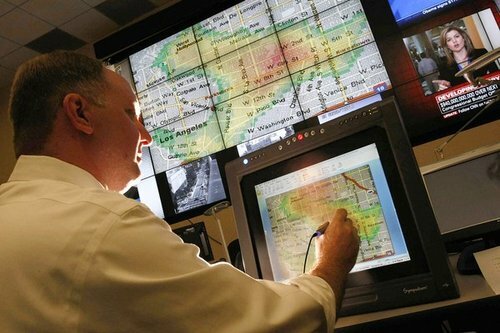 Automated, detailed crime forecasts tailored to each of the department’s 21 area stations would be streamed several times a day to commanders, who would use them to make decisions about where to deploy officers in the field. For patrol officers on the streets, mapping software on in-car computers and hand-held devices would show continuous updates on the probability of various crimes occurring in the vicinity, along with the addresses and background information about paroled ex-convicts living in the area. In turn, information gathered by officers from suspects, witnesses and victims would be fed in real time into a technology nerve center where predictive computer programs churn through huge crime databases. Ed. Note: Here’s a prediction: high unemployment and home foreclosures lead to crime. Get people back to work and in their own homes and you won’t have to predict where they’re going to steal. This entry was posted in NWO and tagged lapd, minority report, police state, predictive policing. Bookmark the permalink.